Membership Contest! 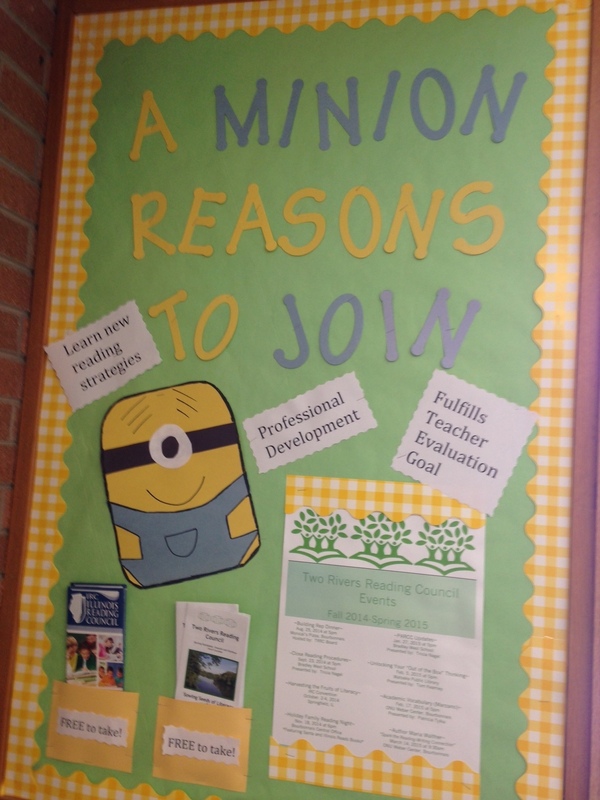 Give your forms to your Building Rep.! Congratulations to Mary Fitzpatrick, one of our building representatives from Bradley West School! 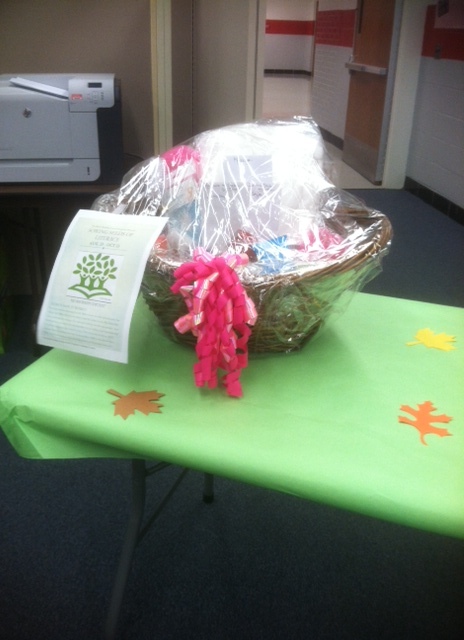 She won the Membership, Muffins, and Massage basket for her TRRC promotional display! 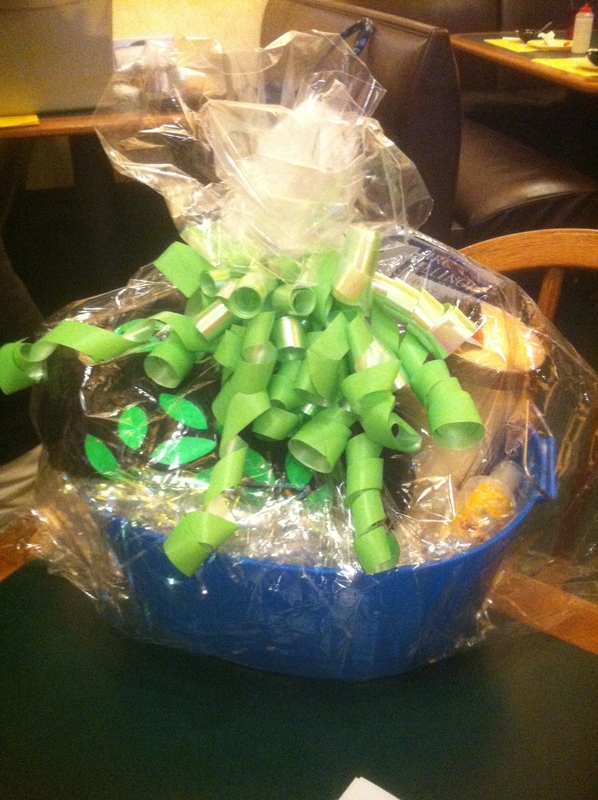 Congrats to Linda Cunnington for winning the SPA BASKET! Linda is a new member from Taft school in Kankakee, where she teaches first grade. Congrats and welcome, Linda! Fall 2014 Updates: Membership Drive, Survey, Events & New Prizes! $40 instead of $45 if you sign up or renew by Oct 15th! 1. Our goal this year is to make our membership stronger for middle school & high schools. We are looking to find members to represent their building at our general membership meetings. These meetings are held before events about 4-5 times a year. We are only as strong as our membership. We want to make our organization so much fun and beneficial to all our members. Professional development is very important with all the of new changes to education. 2. Have you ever considered becoming a leader in your building? It’s important to become involved in a professional organization (just look at your new teacher evaluation tool)! 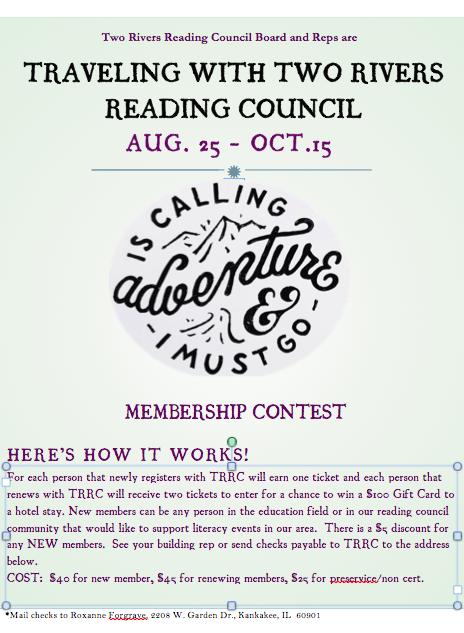 When you join your local reading council, Two Rivers Reading Council, you also become a member of the Illinois Reading Council. I believe the new teacher evaluation tool mentions something about being an ACTIVE member of a professional organization. Now’s your chance…sign up and REPRESENT your building! 3. We want to know what you think! TRRC EXPLORING CAREERS~ FREE Books! 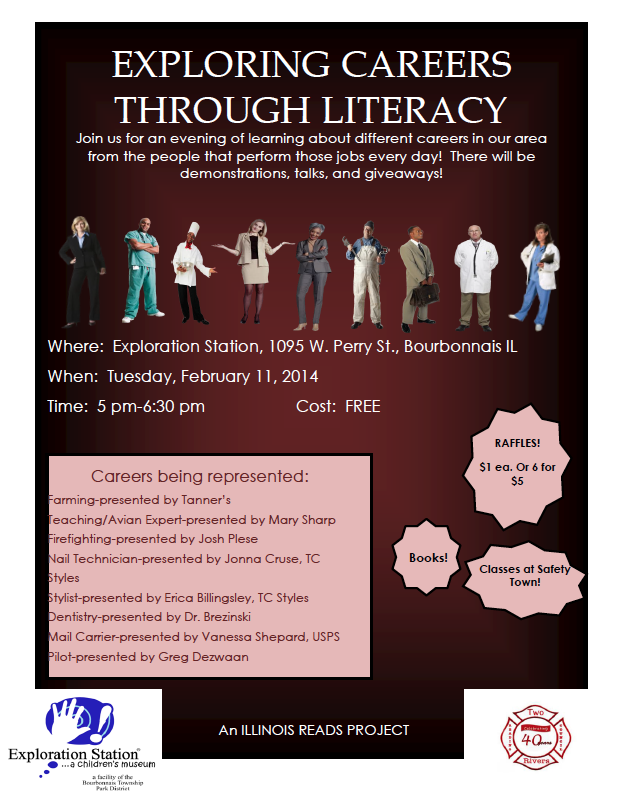 Join us for an evening of learning about different careers in our area from local residents! There will be books given away for all ages! — at Exploration Station…a children’s museum. Free books will be handed out to children of all ages! Kelly Carroll, 8th grade ELA teacher at Bradley Central Middle School won the Kat Falls Contest earlier this school year. Mrs. Carroll won three books and a chance for her students to Skype with the author, Kat Falls! CHILDREN’S & YOUNG ADULT BOOK SALE! Most books are $1 – $3 – some pop- ups are $10. Some hardbound books are $4 – $8. I have some of the 2014 Monarch, Blue Stem, Caudills, and Lincolns. This will probably be the only fall sale. We (ONU) do not have a date for Professional Development Day, but we’re looking at possibly after the first of the year. Cash and checks only – come and Christmas Shop. Share this information with your practicum teachers, schools, friends, neighbors, and all others! Calling all Middle school teachers! Kat Falls author visit through Skype contest. 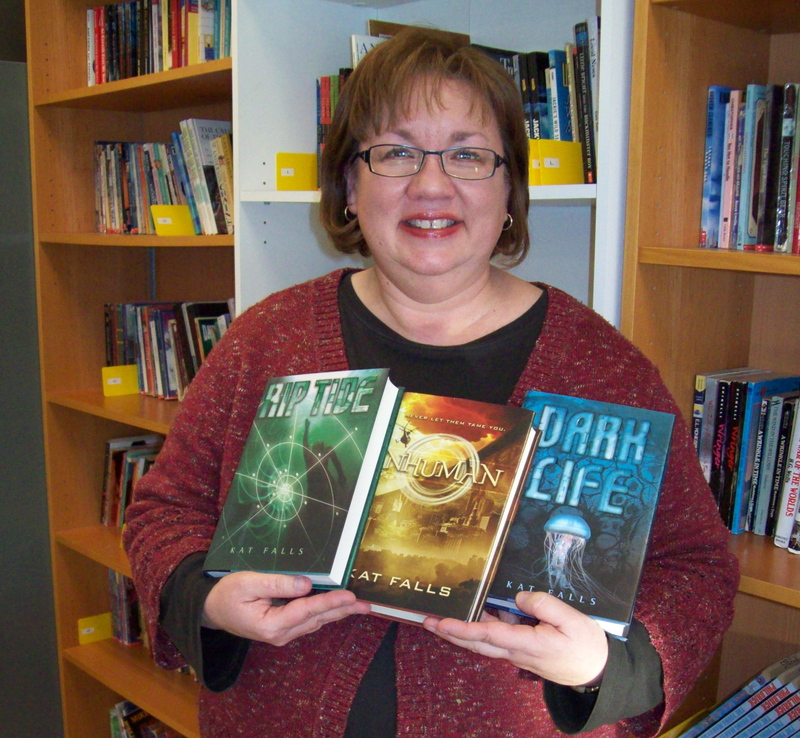 She is the author of Dark Life, Riptide and Inhuman. TRRC council is offering one lucky Middle School Classroom a visit from Kat Falls this fall. If you are a middle school teacher and a Member of TRRC/IRC your class can be entered into a drawing to win this FREE author visit. If you are not a member join by October 15 for your chance to win!